In late February I convened a small group of people with the intent of experiencing nondual consciousness. This took the form of a conference call with eight of us participating. Our facilitator was Sperry Andrews who has been creating these experiences for thirty years. While I’ve had flashes of nondual consciousness over the years I became more interested in creating it on demand, so to speak, while designing the Four States of Consciousness model for FutureShapers last year and writing an article on it which appeared in this newsletter last December. Let me begin with my explanation for what I mean by nondual or unity consciousness. When I am having the experience of being one with every living thing, not merely close to or connected to but the same as, I call this unity consciousness or the realm of nondualism. Peter Russell explains nonduality as sharing the same essence while having unique characteristics. Hence, we are all one yet have individual personalities. 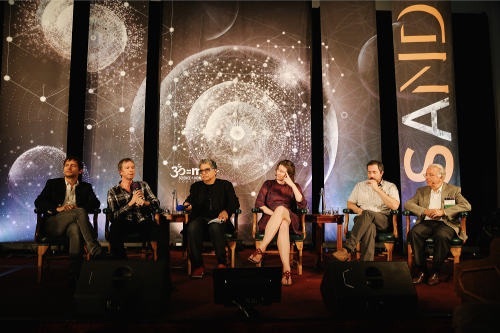 At left is a video of Russell speaking at the 2016 annual Science and Nonduality (SAND) Conference (click on photo to start video). In the two hour conference call with Andrews we began with eight or nine minutes of meditation, then were invited to share something about being aware of the collective awareness we sensed without using certain words that the mind is very used to using – personal pronouns mostly. Needless to say, my egoic mind wasn’t delighted with this exercise. There were several rounds of these shared observations, each one getting a bit lengthier, as we followed one another in rotation. By the time we hit ninety minutes, it was time for review and feedback. Every one of us found the experience profound. Based on thirty years of experience doing this work, Andrews suggested that the first session is usually the most challenging mentally, with the mind being new to the format. “A second call might be more emotional,” he told us, “while a third call might be the most profound experience of the three.” Everyone on the call seemed eager to have another call so plans are afoot to make that happen. One of the phrases that Andrews used in our call was the “indivisibility of being,” which as a writer I found so tantalizing than it inspired this writing. I like it better than “nondual” as a label and, for me, it certainly is more elegant! Regardless of what you call it, this unity consciousness is incredible sweet, joyous and quite palpable – the energy is synergistic with other beings having similar experiences without their individual egos getting in the way.